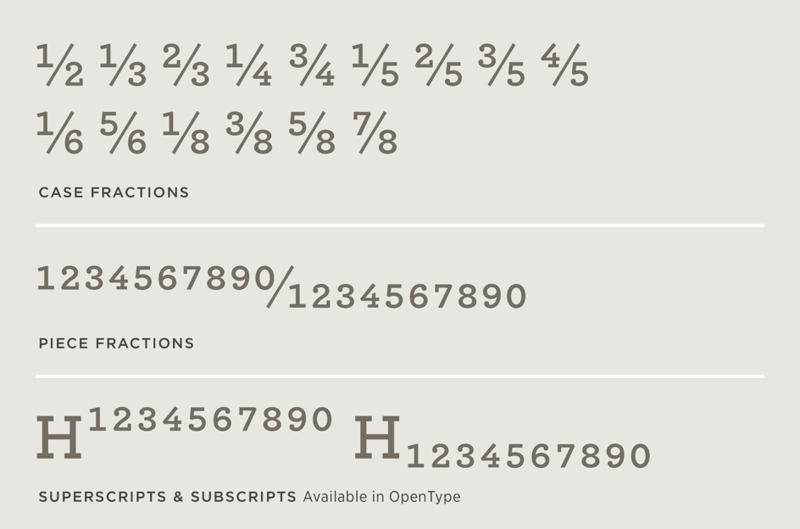 Archer Font Features: Numerics | Hoefler & Co. Lining figures for titles, old-style figures for text, fixed-width figures for tables, and fractions and indices and more — they’re all inside. Lining figures, standard in all editions of Archer, are designed around the shapes of the uppercase. 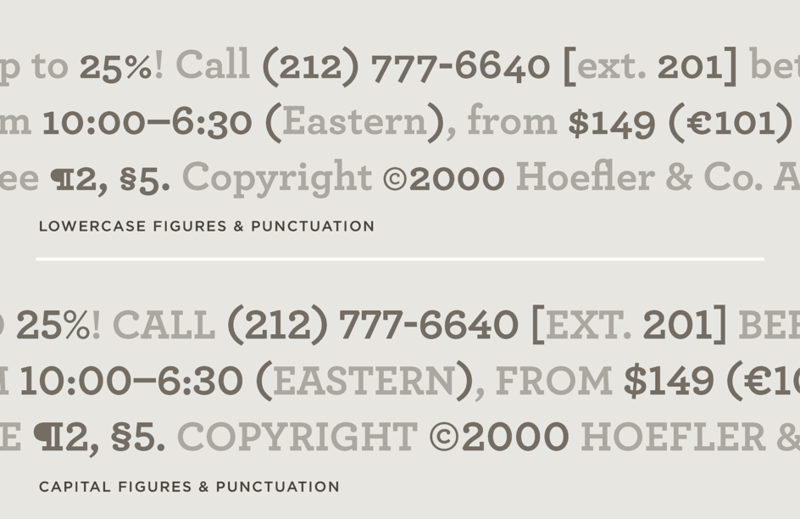 While lining figures are always recommended when setting in all caps, Archer’s lining figures have been designed to a proportion that makes them attractive and useful in upper- and lowercase setting as well — especially useful in newsier contexts where old-style figures might seem quaint. Old-style figures, also known as “ranging figures” or “non-lining figures,” are numbers whose shapes are designed to harmonize with the proportions and rhythm of the lowercase. Old-style figures, intended for use in upper- and lowercase text, are essential when accompanying small caps; they’re especially useful for postal codes which contain both letters and numbers. Both old-style and lining figures are standard in every edition of Archer. For each of Archer’s weights, we’ve designed a full set of tabular figures, built on a fixed width to ensure that columns of data align correctly. Tabular figures are included in both the Archer Pro editions and the Archer Complete package. 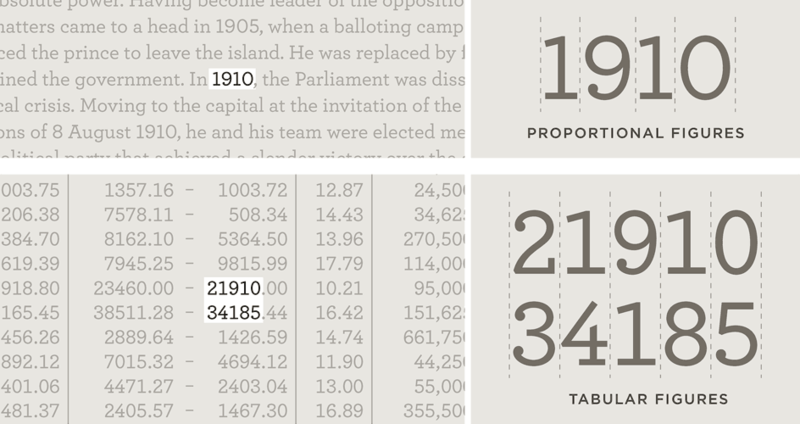 Archer’s tabular figures maintain the same character widths throughout the complete range of weights and styles, an essential feature for when boldface is used to highlight an entire line (as is common in stock listings and sports statistics.) In each of Archer’s styles, the fractions, monetary symbols, and mathematical operators are built on matching widths, so that a price expressed in dollars won’t affect the grid when the currency is recalculated in Euros. Pro editions of Archer include readymade “case fractions” in denominations of halves, thirds, fourths, fifths, sixths, and eighths. Also included is a full set of numerators and denominators, all properly kerned to the fraction bar, for creating custom fractions. OpenType users will also find superscripts and subscripts included, useful for both footnotes and scientific formulae. Like its two sets of figures, Archer includes two sets of punctuation, one designed to accompany the lowercase and one designed for the caps. The same OpenType feature that activates the "all caps" setting will introduce lining punctuation, properly weighted and positioned to match the capital letters. Archer includes lining variants of its monetary symbols, commercial and legal marks, math symbols, enclosures, and dashes. 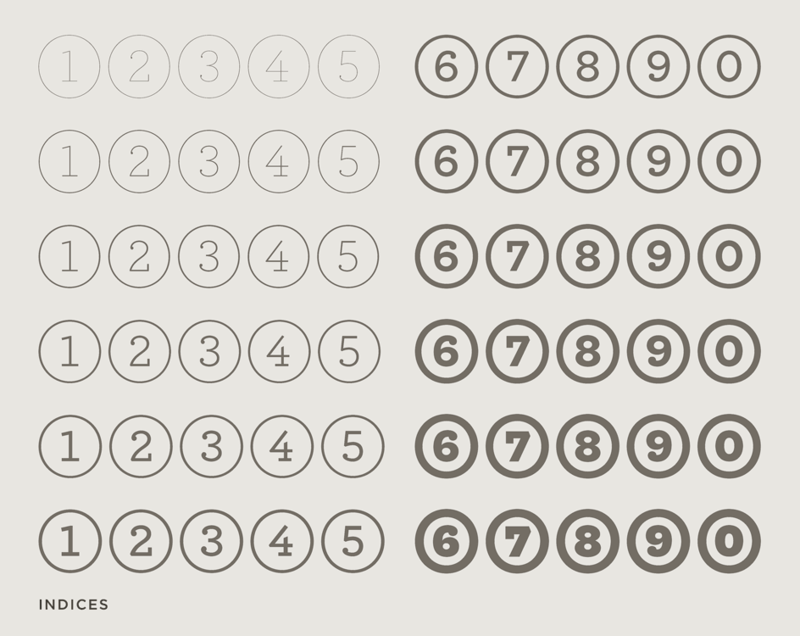 “Numbers in circles” seem so straightforward until you try to make them yourself. (Especially if you’re on deadline.) Since designers have better things to do than wrestle with a zero that’s both wider and taller than a one, we’ve created a set of encircled digits for each of Archer’s weights. They’re indispensable when numbering the steps in a recipe, labelling the parts of a diagram, or marking key places on a map.